Last time I wrote I was talking of our upcoming road trip, I recall mentioning it being the light at the end of the tunnel for us after a busy four years! It seems I spoke too soon, as the light turned out to be a freight train heading straight at us, taking us by complete surprise! Our 'healthy as a horse' youngest son Jake, became very unwell with appendicitis, leading to peritonitis and surgery. As if this wasn't enough for him to overcome, unfortunately he then had to return to hospital again, suffering a post op abscess. All in all, this meant we have spent the past four weeks in and out of hospital, as he was treated and began to recover! Today we got the all clear from his follow up ultra sound. Although we are a little behind in our planning and organising to depart on our trip in just two and half weeks time, we are ever so grateful to see our boy well again and so thankful it all happened before we hit the road. After a constant four weeks caring for our son, it was like therapy for me to enjoy a wonderful evening at the Kinfolk Dinner at Glenmore House last night. First some background, I came across freelance photographer Luisa Brimble through Instagram, when I discovered her beautiful images of food and shared table gatherings. When I actually met her face to face, I liked her immediately, Luisa is a woman with such infectious joy, enthusiasm and hardworking determination to make things happen. Luisa has been responsible for many Kinfolk gatherings in Sydney this past few months and this culminated over the last week, with a visit from Kinfolk Magazine founder & co-owner Katie Searle-Williams and chief event organiser Julie Pointer from the USA, arriving in Sydney for the first Australian Kinfolk Retreat. I was privileged to be apart of the weekend retreat, by organising and hosting a breakfast and market tour of Eveleigh Farmers' Market on the Saturday morning. The group of sixteen guests then headed to Patonga, for two days of workshops and shared table experiences, at Koskela's lovely Dickebusch property. 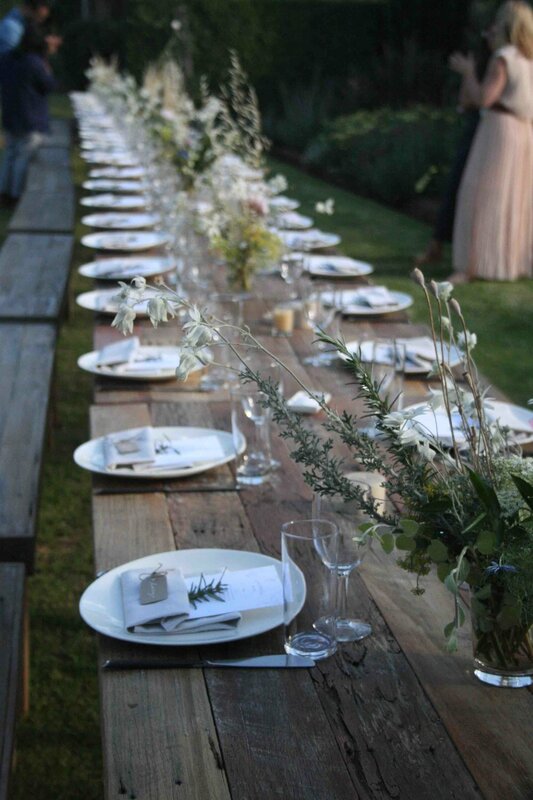 The final part of the visit for Julie and Katie was the first ever Kinfolk Dinner Series in Australia, held at the picturesque property known as Glenmore House. Mickey and Larry Robertson shared their unique and historic country home and working garden in the NSW Southern Lowlands, just an hour south from Sydney's CBD. Many hands came together to partner and make this evening happen, I am hoping you will enjoy the images captured and that they will give you a sense of just how special a gathering it was. Upon arrival we were greeted by what was described as 'the grazing table'! And then the food began to arrive from partner caterer Mario from Mario's Kitchen, he was wanting to share the traditional food of his family and it was delicious, made with so much love.